Reside, have property or a business in Orleans Parish and wish to help reduce crime by dramatically increasing the efficiency of local law enforcement? Simple! 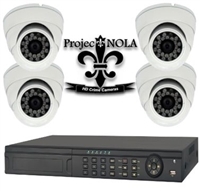 Simply sign up to host a High Definition ProjectNOLA loaner crime camera. Once up, you may view live video from your crime camera, which transmits HD video via your broadband Internet connection to our Incident Monitoring Center, where crime camera footage is recorded to our cloud. When notified of a dangerous situation in progress or felony crime, ProjectNOLA staff may instantly begin reviewing crime camera video over a large geographic area in effort to provide real time supplemental information to responding officers and detectives. Since 2010, the ProjectNOLA nonprofit crime camera system has helped reduce crime, improve quality of life, and stimulate economic growth in the neighborhoods we serve. When crimes do occur, our being able to very quickly review and digitally transmit HD crime camera footage to detectives routinely often results in a faster arrest. Criminals are also more likely to confess and implicate others while being interviewed and plead guilty at court. Felony cases are resolved faster, potentially saving millions in tax payers dollars, moving convicted felons quickly out of local jails and into state penetentaries. 2mp HD Wi-Fi Day/ Night Loaner ProjectNOLA Crime Camera featuring wireless playback and IR emitters. Borrower agrees to the $15 MONTHLY maintenance fee and ensures to maintain Internet connectivity to the ProjectNOLA cloud. Featuring a 3 Mega Pixel sensor, super-wide angle view, built-in IRs for seeing in complete darkness, on-board recording that allows you to view live and recorded video via the Internet, and Wi-Fi to help make installations a snap, Project NOLA welcomes you to be one of the first to try out our latest HD loaner crime camera. Borrower agrees to a security deposit, which may be fully refunded provided that the borrower continuously remains an active participant with the ProjectNOLA crime camera system and eventually returns the borrowed equipment in good working order. While participating with the ProjectNOLA crime camera system, the borrower may view live or recorded video from the loaner crime camera that they are hosting, via a compatible smart phone, tablet, pad, smart TV or PC. Immediately improve the security around your home, business, school, church or property while helping New Orleans become a safer place to live, work and visit by sponsoring this Loaner FOUR camera crime camera kit that may be viewed in Real-Time at the Project NOLA Real-Time Crime Information Center at the University of New Orleans when breaking crimes and dangerous situations occur nearby. Powerful 1080p HD Day/Night crime cameras feature super-wide angle lenses and may see individual leaves on trees and blades of grass on the ground down the street regardless of lighting conditions. View both live and recorded video from virtually anywhere in the World via a compatible internet-connected smart phone, device or PC. You may even receive automatic notifications when motion is detected! Advanced 360-degree Pan-Tilt-Zoom WiFi HD Low-Profile Loaner Crime Camera featuring Sony Day/Night Exmor sensor, automated guard tours & scanning, eAlerts on motion detection, and simple one-button setup. Get, install, & start viewing in just minutes!